•What’s going to happen in my life tomorrow, next week, & next year? •Who am I going to marry? •What is going to happen in my career? •Am I going to be Successful? •Is my marriage going to last? It is God’s plan and His will that you have a great future! Jeremiah 29:11 NIV – For I know the plans I have for you,” declares the Lord, “ (good) plans to prosper you and not to harm you, plans to give you hope and a (good) future. Galatians 6:7-8 NIV – Do not be deceived: God cannot be mocked. A man reaps what he sows. 8 Whoever sows to please their flesh, from the flesh will reap destruction; whoever sows to please the Spirit, from the Spirit will reap eternal life. Don’t go through life allowing things to happen, instead make thing things happen! Your Life now is a reflection of your past decisions. Choose – pick out or select (someone or something) as being the best or most appropriate of two or more alternatives. Your future is not a matter of chance, but a matter of choice! 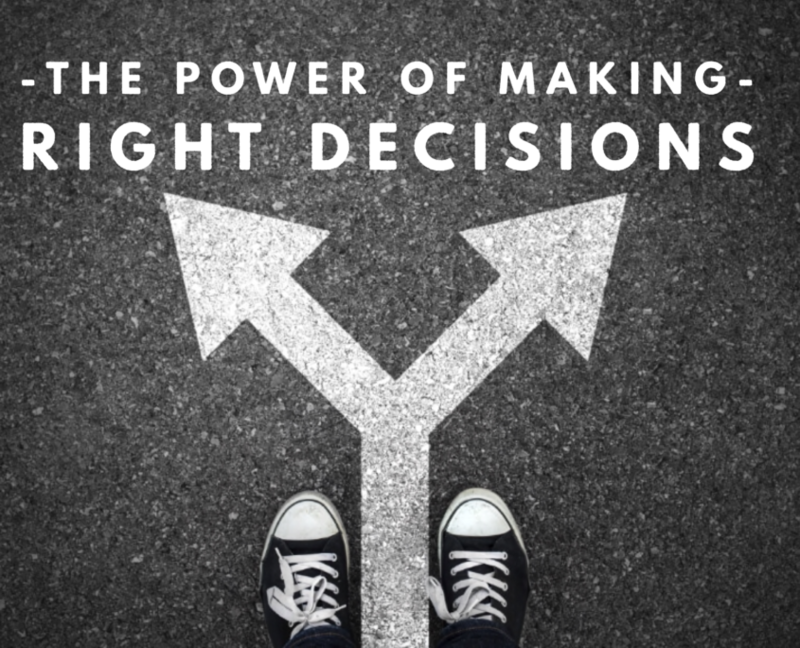 Today’s decisions will have a big impact on your life and future. What makes the difference in the quality of people’s lives? Any study of history shows that the difference in human beings comes down to one thing: an ability to harness the power of decision, often in spite of adverse conditions. The history of our world is the result of decisions. •Rosa Parks to remain in her seat and state, “No, I will not go to the back of the bus.” It would change the structure of society and the world. George Jones was a country music icon from the old school. A lot of his songs are the stereotypical country “cheat’n & drink’n” songs. And the fact that George Jones had a drinking problem was no secret. But on March 6, 1999 country music fans were horrified to hear that Jones was critically injured when he crashed his Lexus into a bridge in Nashville. The investigation showed that George had been drunk at the wheel. Thankfully he recovered, and two months later his new album called “Cold Hard Truth” came out and on it was a hit song titled “Choices”, and ironically the hook line says, “I’m Living And Dying With The Choices I Made”. 3. Bank robber in Germany pulls out a gun & demands $. Teller said she needed his ID. So he gets it out, takes the cash and leaves the ID. Luke 15:11-20 NIV – Jesus continued: “There was a man who had two sons. 12 The younger one said to his father, ‘Father, give me my share of the estate.’ So he divided his property between them. 13 “Not long after that, the younger son got together all he had, set off for a distant country and there squandered his wealth in wild living. 14 After he had spent everything, there was a severe famine in that whole country, and he began to be in need. 15 So he went and hired himself out to a citizen of that country, who sent him to his fields to feed pigs. 16 He longed to fill his stomach with the pods that the pigs were eating, but no one gave him anything.17 “When he came to his senses, he said, ‘How many of my father’s hired servants have food to spare, and here I am starving to death! 18 I will set out and go back to my father and say to him: Father, I have sinned against heaven and against you. 19 I am no longer worthy to be called your son; make me like one of your hired servants.’ 20 So he got up and went to his father. “But while he was still a long way off, his father saw him and was filled with compassion for him; he ran to his son, threw his arms around him and kissed him. This young man comes to his senses after a bad decision and starts thinking about what his life SHOULD be like instead of what his life IS LIKE. 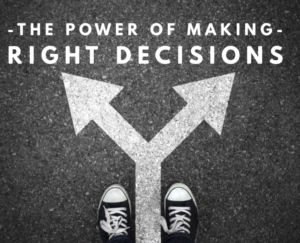 Making a right decision is the key! He decides to leave the pig pen! •The floodgates can be open with ONE DECISION. Bringing us joy or sorrow, prosperity or poverty, companionship or solitude, long life or early death. Ecclesiastes 7:1 NIV – A good name is better than fine perfume, and the day of death better than the day of birth. Proverbs 13:20 NIV – Walk with the wise and become wise, for a companion of fools suffers harm. It never fails. You can’t choose your family, but you can choose your friends! Wrong relationships are thieves to your success – Relationships help define who we are and what we become. Recognizing that you may be facing a difficult decision right now, or soon will be, I want to give you some “guidance guidelines” from Proverbs that will help you make wise choices. Ask God – God knows everything, and is perfect in wisdom, God has an expectation that we will always seek advice from Him in our decision making. Have I prayed about the decision? Am I seeking the Lord daily and allowing Him time to give me His direction? Most of the bad decisions I make are the result of not taking the necessary time to lay things out before the Lord. Here’s a principle: When possible, choose to pray and ponder for at least 24 hours before making a decision. Matthew 7:7 ESV – “Ask, and it will be given to you; seek, and you will find; knock, and it will be opened to you. 2. Look into the Word of God. What principles, commands, or prohibitions from the Bible apply to the decision you need to make? Has God given any promises or motivating verses on the subject? Most of the situations we’re faced with are already dealt with in the Word of God. 3. Seek Advice. The simple message of these Scriptures is: Get advice. Proverbs 19:20: “Listen to advice and accept instruction, and in the end you will be wise.” When faced with a decision, find a faithful friend or two and ask for their input. Let’s bring it down to everyday life. *Is it right for me to lie? *Is it right for me to cheat on my tax return? *Is it right for me to commit adultery? *Is it right for me to neglect my children? My character defines who I am as a person. I’m not perfect, but if I want to make quality decisions throughout life, they have to be based on what is right. 5. Is it good for others, or just good for me? Will my decision be good just for me? How will it affect others? Will it only benefit me, and leave others out? Or worse, will it have a negative impact on others? Phil 2:4 Let each of you look out not only for his own interests, but also for the interests of others. Selfish decisions don’t please God. When I look at taking a course of action, I have to ask myself the question: Is anyone else going to benefit from this, or is it just going to be me? Is there anything you are not happy about in your life, career, health and money? Make a decision Right Now about how you are going to change it. Don’t waste your life! Don’t settle for second best! Don’t go through life just existing, coping, or getting by!